All eyes were fixed on Jon Lester for the Cubs and Pirates penultimate series of the year. Jon Lester’s performance may have soothed the worst of many fans fears as he showcased what makes him an ace. Lester made the most of his efficient and fast six-inning outing. The Pirates managed to pull off five hits against Lester which would turn out to be all for naught, as they struggled to get ahead in the count and when they did they often struck out. Lester had eight Ks on the evening, matching his career high. Outside of two baserunners in the fifth inning, it was smooth sailing for the veteran pitcher. The bullpen would pick up where Lester left off. Steve Cishek gave up the bullpen’s only hit in the final three innings. Carl Edwards Jr. made quick work of the Pirates in the bottom of the 8th by inducing three groundouts. There was mild drama in the ninth. After striking out the first two batters he faced and on the verge of striking out his third Pedro Strop plunked David Freese, surrendering the first unearned base of the evening. All is well that ends well though because Strop turned around and got Diaz to ground out to end the game, a very fast two hour and forty-eight minute affair. Offensively, it was an off day for the Cubs. They managed to get seven men on base but failed to muster up the bat strength to send any of them home. 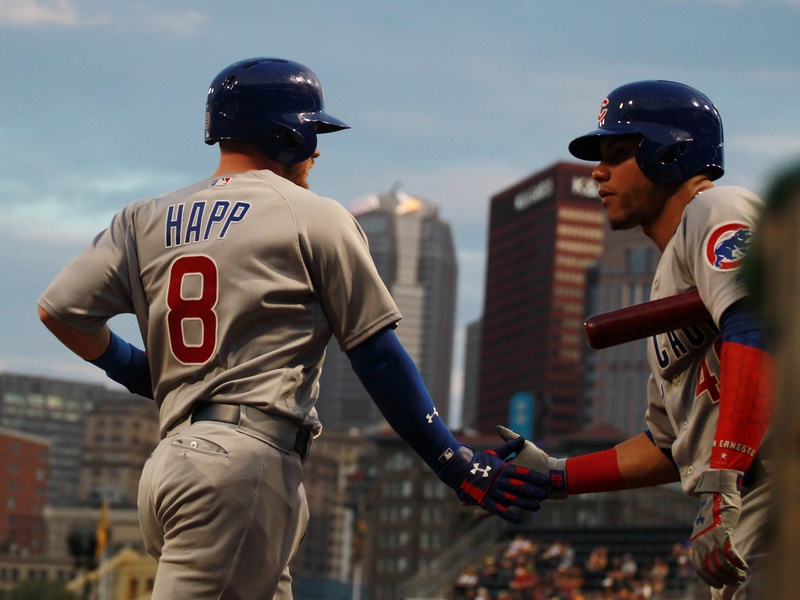 Fortunately, that turned out not to matter as Ian Happ’s solo fourth-inning home run would be all the team needed to secure them their 70th season win. Next Level: Frustrations with the offense’s inability to score runs, save for Happ’s home run, were easily tempered as the defense was working in tandem with the pitching staff. Aside from Josh Harrison making it to third in the fourth inning, no Pirate would advance past first, though not for lack of trying. Starlin Marte attempted to steal second in the sixth, which in retrospect seems foolhardy as Contrera’s bullet throw to Baez’s already in motion signature tag had Marte dead to rights. Was it smooth? Yes. Was it setup by a perfectly executed pitch out by Lester? You bet it was. The Cubs made nary a defensive bobble, and if there was all is forgiven since routine plays were consistently made throughout the game. Tonight David Bote’s glove was the impress-er. He made arguably the most important defensive play of the game when he initiated a 5-4-3 double play in the first inning. Jon Lester needed that double to solidify not only his confidence in himself to pitch out of jam, but also to assure him the seven players behind him were defensively steadfast and present to win the game. Lisa is a lifelong Alaskan with no traceable ties to Chicago. She is known to enjoy the occasional excursion into the wild, and keeping company with cats.